Home / Spring has sprung! Of course, naturally this is our number one choice! We are pleased to announce that we can now offer the option of beautiful coloured bulbs in our letters, as well as our ever-popular classic white LED bulbs. 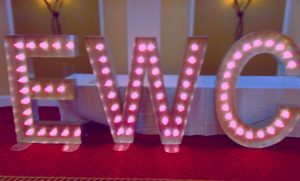 You’ve chosen a colour theme for your flowers, bridesmaids, and tables, so why not match your letter lights too? 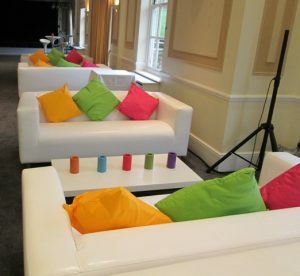 We can cater for most colours, just ask! 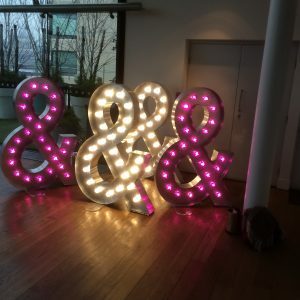 Take a look at these that we installed recently, for a corporate customer who wanted letters in pink for a themed event…….and our ampersands, shown here in both traditional white, and contrasting purple! 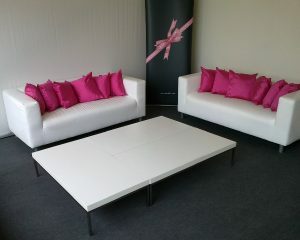 Another way to add colour in a subtle yet effective way, is to use ribbons. Add ribbons in your theme colour everywhere! Tie little ribbons around your wineglass stems, napkins and candleholders, anywhere you like. This is a great way to add little touches of colour and detail. For table centrepieces with a difference, fill clear glass bowls with water and use food colouring to tint the water to your theme colour and float a few flower blossoms in each one. You could even add floating candles too to create even more of a magical glow! 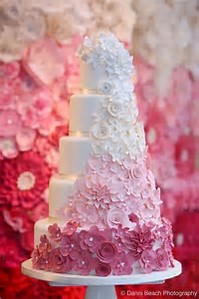 We have noticed that coloured ombre cakes still remain a firm trend, but to change it up a little, rather than going for a full ombre cake, why not go for a traditional white tiered cake, but just add ombre flowers. We think this one is just stunning! ← February – the perfect month to pop the question!